Star Wars now has its own Indiana Jones. It comes in the form of a young female inter-galactic archeologist named Doctor Aphra. Dr. Aphra is one of the biggest surprise successes to come out of the 25 issue limited comic series Darth Vader. So much so, in fact, that she now has her own ongoing series aptly titled Star Wars: Doctor Aphra. A one-time aider and abetter to the Dark Lord of the Sith, Dr. Aphra’s life seemingly came to an abrupt end when Darth Vader tossed her body into space at the end of the Darth Vader run. There she floated, until she was picked up by her murderous droid duo of Triple Zero and Beetee. Dr. Aphra was revived, and with everyone thinking she had died, has moved on with a new life after death. 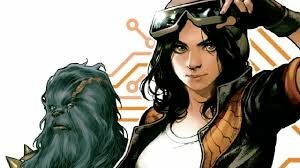 Flanked with her own Wookie, Black Krrsantan, she sets sail on her new adventures in Doctor Aphra #1. 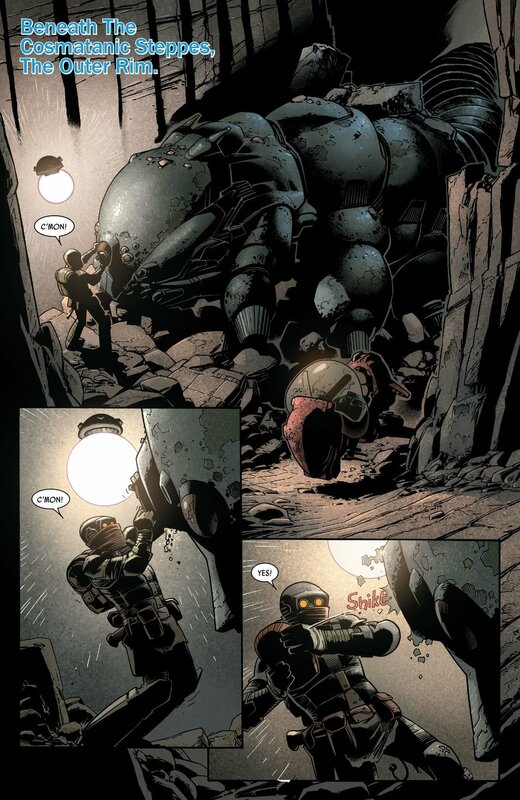 The comic begins much like an homage to George Lucas’s other iconic franchise: Indiana Jones. 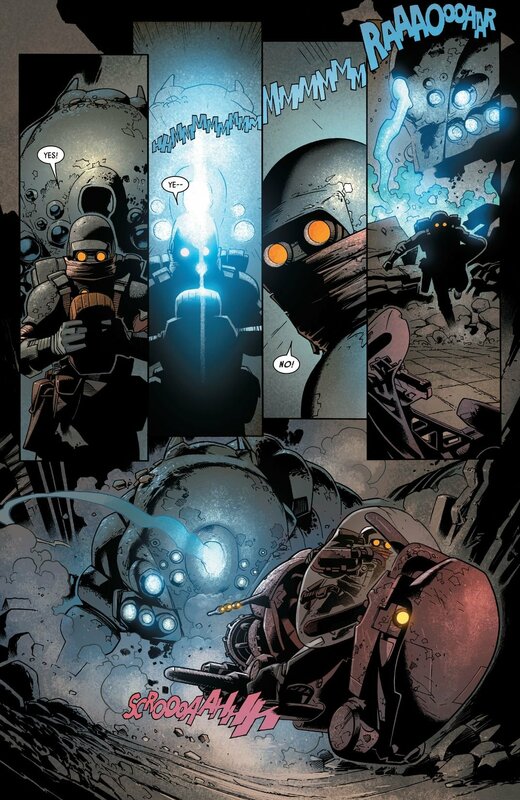 Reminiscent of the opening in Raiders of the Lost Ark, Doctor Aphra #1 starts in a dark cave-like structure with someone claiming a rare antiquity looking a lot like the golden idol in the aforementioned film. From there, a chase begins with the narrowest of escape. The only twist is, the person coming out with the boon is not Dr. Aphra. It is one of her rivals. As the rival celebrates his victory, Dr. Aphra sneaks up and claims the prize – at the cost of his life I might add. While this opening only lasted five pages, it does set the series off on an unexpected path. This series has a darker tone than expected. And that is a great thing. While the artwork of series illustrator, Kev Walker, doesn’t match this tone, it has no bearing. In fact, it adds to the surprising nature of Doctor Aphra #1. Doctor Aphra #1 is split into two stories, both written by Kieron Gillen. The first follows Dr. Aphra and her band of murdering misfits; the second is a back story following a younger Aphra doing her graduate studies. Of course, the first story is more exciting and is chockful of flavour – mostly from Triple Zero and Beetee’s interactions with Dr. Aphra. But the latter story does offer an interesting look into Aphra – who she is and what motivates her to buck authority figures. Easily, the biggest standouts in Doctor Aphra #1 are Triple Zero and Beetee. As mentioned before, the two droids (devious doppelgangers to C-3P0 and R2-D2) add a twisted bit of comedy to this first issue. It’s as if our favourite protocol and astromech droids had been locked in a room, watching season upon season of Dexter – minus Dexter’s killing rule of only people who deserve it. Triple Zero and Beetee have no such boundaries. But these two droids allow us to delve deeper into the whole A.I. debate. They are programed this way, without a conscience. Two sociopathic droids who don’t know any different – only until they’re programmed not to kill, would they ever stop. Perhaps an alarming precursor to Terminator type robots roaming Earth. For now, we can enjoy reading about homicidal robots at arm’s length. Or whatever distance you read Doctor Aphra #1. Doctor Aphra #1 offers a surprisingly dark and entertaining tale of the good doctor’s post Darth Vader life.